This weeks focus is on our dried salted ambassade fish, a dry salted haddock, usually small size, split with back bone in. Melanogrammus aeglefinus is the scientific name for this whitefish, which has a mild light taste very similar to codfish. In some African countries this fish is commonly called ambassade. A premium saltfish for the general market. In these African countries, we normally see Makayabu as the main selling product and Ambassade at a higher price and with less sales due to that fact. This fish is commonly called haddock, however in the french speaking countries it can be called églefin or ambassade. Its a very common fish in the cold North Atlantic waters, due the the low fat content it is a very good fish to salt. Splitting of this fish is more likely to be with back bone in, and mostly of small size. African dried salted Ambassade fish, a tasteful part of heritage! Northern Fish offers ambassade fish packed in several types of carton sizes. The traditional 9 kg cartons is most common in the African markets, hence it is also available in 3.5 kg, 4 kg, 8 kg and 10 kg. This salted and dried fish is made with a hard cure making it more resistant to hot climates. Quality ambassade is salted from fresh Norwegian fish. To obtain freshness its especially relevant to be close to the fishing grounds. Therefore coastal fishing boats arrive at our docks every day, unloading the fresh catch directly at our plant in Northern Norway. The fresh fish is then split and salted. Ambassade is split with the back bone in, a very traditional African cut. After splitting, we prepare the fish for a traditional cure in salt, placed is large bins with layers of salt. Much time and technique are used in the making of the finest salted fish. Salting from fresh fish makes our product outstanding. 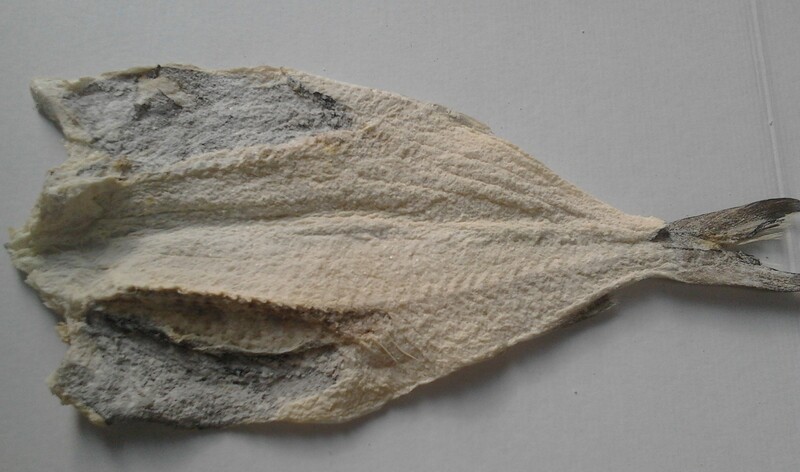 Our ambassade fish is a excellent dried and salted product. Furthermore, well accepted by the market and a major item in the ethnic and exotic category. Made from the finest fresh fish, the taste and texture will undoubtedly overwhelm you. Taste tradition at its finest try our Northern Fish salt fish selection. For further information on our salted ambassade you should visit our Ethnic and Exotic salted fish section which has a great selection of African and Caribbean fish.